Applying for a license plate requires you to go to the Kentucky Transportation Cabinet. You can apply for customized or personalized plates. Vehicles must be registered with the Kentucky Transportation Cabinet (KYTC) in order to drive legally on state roads. You’ll require state license plates and a validation sticker. 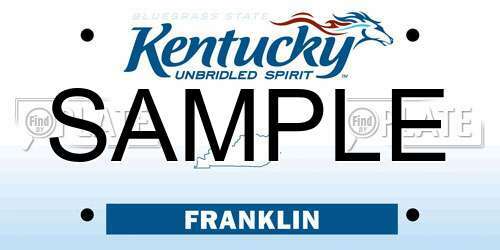 The standard Kentucky license plate has a blue and white background with dark blue characters and a cloud in the centre. Alternatively, you can choose to get customized license plate or personalized for an additional fee. If you have recently moved to Kentucky or you have just bought a new vehicle, you have 15 days to register your vehicle at a KTC office. If you are getting a standard license plate, you may be able to receive it the same day. Other plates, such as personalized or customized plates, take longer to process. The cost for personalization is $25 in addition to the standard registration fees for a license plate. You’ll also have additional renewal fees if you get a personalized plate. Personalized plates take anywhere between 4 to 6 weeks from the date of application to process. Keep in mind, you may not be approved for personalized plates if you violate there guidelines. You will receive a letter in the mail detailing whether your personalized plates were approved, or not. These custom plates come with additional fees. Please contact the KTC for more details about available custom license plates. If your license plates have been lost, stolen, or damaged, you can visit a KTY office to apply for a replacement. If you believe that your plates were stolen, it is advised to contact the police to file a report. This prevents your license plates from being used and abused by someone else, however, you are not obliged to contact the police. The decals attached to your license plate indicate when your plate expires. You should renew your vehicle’s registration in advance to avoid any additional late fees. You can apply for new decals online, in person, or by mail. When you receive your new decal stickers you can place them right over top of the old ones. The renewal fees will be fixed each year based on your vehicle and the type of license plate you have. Your license plates become your property. This means, when you sell, trade, or donate your car, you will keep your license plates. The person obtaining your vehicle would be responsible for registering the car under their name and obtaining a new set of license plates. If you are to purchase a new vehicle, you will be permitted to transfer your license plates over to the new vehicle. You must go to the KTC and apply for the transfer. Note: you cannot transfer license plates from a car to a motorcycle. They can only be transferred to the same vehicle type. If you (1) sell your car, (2) move to a new state, or (3) cancel your insurance, you may have to surrender your license plates. You can surrender your plates by mailing them to the KTC office or dropping them off in person. When you register your vehicle, you are expected to make payment right away. You’ll be required to pay property tax, service fees, and additional fees before being able to receive your plates. Note: the above fees may vary by county. Be sure to contact your local KTC office to confirm the costs before you register your vehicle. All you have to do to look up license plates in Kentucky is enter the plate number and wait for the results. You’ll obtain access to detailed information about the plates and you can check to see if the plate you want is available.